Danier Leather Inc., the Canada retailer of leather clothing and accessories, has selected Truecount Corporation RFID software to pilot in three Danier retail locations to increase inventory accuracy, visibility and replenishment. Truecount’s integrated real-time replenishment feature ensures items received from distribution centers are placed on Danier sales floor as quickly as possible to reduce out-of-stocks and to ensure that every items is correctly represented. 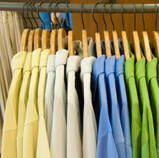 RFID software monitors what is on the sales floor and in the stock room at all times. As items are sold a replenishment list is automatically generated to move items from the stock room to the selling floor. This ensures customers find what they expect or are looking for, and don’t leave the store empty-handed. In addition to Truecount’s RFID software, each Danier store is using Motorola Solutions’ FX7400 RFID readers and MC3190-Z RFID handheld computers.